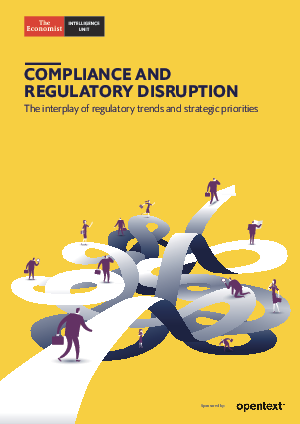 In a recent The Economist Intelligence Unit (EIU) report, Compliance and regulatory disruption: The interplay of regulatory trends and strategic priorities, 64% of surveyed executives worldwide reported that compliance trends are obstructing their strategic goals. But fortunately, information governance is making a critical difference. Learn what enterprises like yours are doing to conquer compliance. And get all the latest compliance management trends and best practices.